Born from over a year of dedicated research and personal experiences, Joulez empowers tween girls to enter the fields of science, technology, engineering and math (STEM). Joulez incorporates four key elements into its approach: identity, vocabulary, skills and tribe. They believe that each of these four areas must be addressed to engage girls in STEM over the long term. Founder and CEO of Joulez, Stephanie Rowe, has spent her whole career in STEM surrounded by mostly male coworkers. Through her research, Stephanie became acutely aware of the importance of STEM skills in getting the jobs of tomorrow. So much so that experts predict STEM skills will be required to get into the middle class. Stephanie knows girls will need these skills to get the jobs that will allow them to take care of themselves and their families. Joulez sets out to increase the number of women in STEM fields. In Harris Interactive Study commissioned by Microsoft: STEM Perceptions: Student & Parent Study, researchers questioned college males and females majoring in STEM about what was the biggest influence for their decision to enter into that industry. The study found that 61% of males said “Toys and Games while only 29% of women said “Toys and Games.” 68% of women say that, “A teacher or a class” was the biggest factor in why they became interested in STEM. At a young age, girls and boys are exposed to different messages and materials that encourage them in certain careers. Seen above are the covers of 2016 Boys Life and Girls Life. 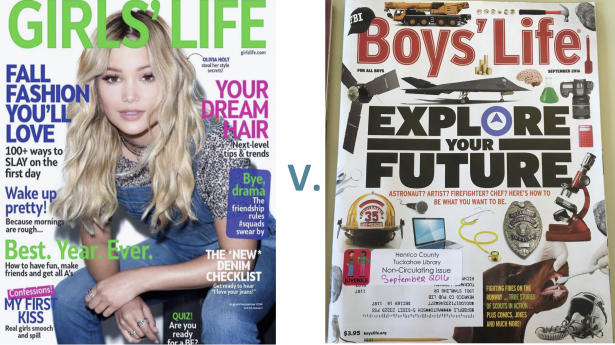 Boys Life writes about becoming an astronaut and other STEM topics. This increases a boy’s STEM identity and vocabulary. While the Girls Life cover depicts the “hottest” fashion trends, speaking nothing of STEM nor increasing a girl’s vocabulary on the topic. Below are side-by-side pictures of the 2016 Boy Toy of the Year and 2016 Girl Toy of the Year as awarded by the Toy Industry Association. With reinforcement of outdated social standards for young boys and girls to constantly see, the world needs more socially conscious missions like Joulez. Joulez has already gained the attention of news outlets like NECN. In 2016, Joulez participated and achieved Gold status in MassChallenge. I had a chance to meet with the Founder and CEO of Joulez, Stephanie Rowe, and Mechanical Engineering Product Design Intern, Lisa Gardner, at their office to discuss their experiences creating Joulez. “Moving to Boston to work with Joulez has been an adventure. This is my first time working at a startup. 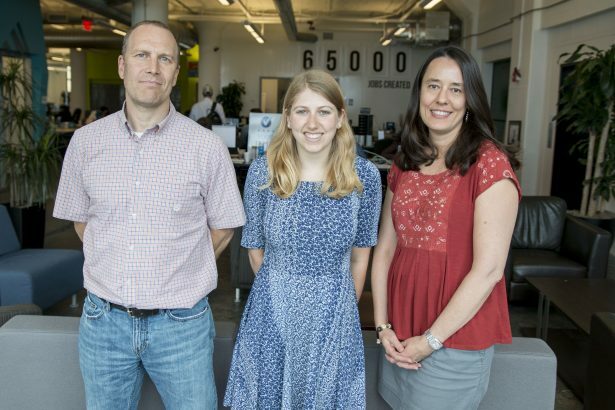 Being in the environment of MassChallenge, having access to so many resources and getting to work with the Joulez team has been an enriching experience that I will take with me when I go back to school. I learned SOLIDWORKS while studying in the Schreyer Honors College at Penn State. Getting to use the knowledge I learned there with Joulez has tested my skills with the software and taught me so many more tricks,” Lisa told me. Joulez continues to work out of MassChallenge as alumni of the program helping the incoming class. They have started Beta testing different versions of their first product. Joulez hopes to launch their product to market in early 2018. Thank you to Stephanie Rowe, Lisa Gardner and Joulez for being SOLIDWORKS Entrepreneurs and sharing with our community.